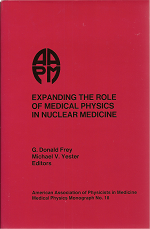 The field of nuclear medicine has been undergoing a renaissance in recent years. The widespread application of SPECT imaging and the slow diffusion of PET techniques have revitalized nuclear imaging. At the same time, rapid developments in radiopharmaceuticals have produced new imaging methods. This book focuses on SPECT, PET, and monoclonal antibodies. Other areas covered include radiation safety, bone mineral analysis, and nonstandard instrumentation. G. Donald Frey, Michael V. Yester, eds.